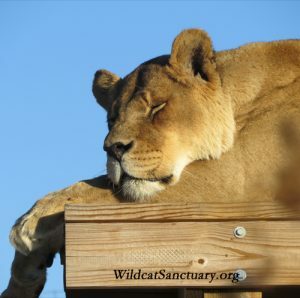 Shanti Deva and two other lions came to TWS in 2006 when Catskill Game Farm in New York closed just before Christmas. Catskill auctioned off 950 animals, making this one of the biggest animal rescues TWS has ever helped with. Many worried some of the animals would wind up in the hands of unscrupulous dealers. Or that animals, such as deer or goats, would go to people who run ‘canned shoot’ operations where hunters pay to shoot fenced-in animals. Wildlife Watch intervened with these lions. They wanted to make sure they went to a safe place that they could call their forever home. That’s when they contacted TWS. Shanti Deva and two other lions came to TWS in 2006 when Catskill Game Farm in New York closed just before Christmas. Catskill auctioned off 950 animals, making this one of the biggest animal rescues TWS has ever helped with. Wildlife Watch intervened with these lions. They wanted to make sure they went to a safe place that they could call their forever home. That’s when they contacted TWS. Shanti Deva was born in 1995. She is one of our oldest residents. It was unusual she was the alpha of her pride before the others passed, even though Aslan (a male lion) was part of the pride. 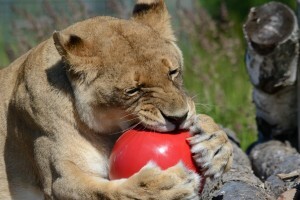 Shanti was always the most adventurous of this pride of three lions. She’s still the first to check out new enrichment and talk to new care takers and interns. She loves to kick back and relax, while chatting it up with anyone who passes by. Most mornings and evening are filled with Shanti caroling to her neighboring tiger friends. They love responding back. She’s very artistic and loves painting her ‘masterpieces’ for our auctions. Even with her pride gone, she’s never felt out of place with all of her tiger and caretaker buddies. You can help provide daily care for Shanti Deva by becoming her sponsor today. Your generosity will be greatly appreciated.